The CJF2119.BA0594 TAG Heuer Link Calibre 16 Chronograph Roman Numerals Men’s Watch is part of the latest additions to the Link line, and was recently debuted at the Basel Fair in Switzerland. A sophisticated watch not yet available to the public, this watch is sure to attract a lot of attention when it is released in the Spring of 2010. The TAG Heuer Link Calibre 16 Chronograph Roman Numerals is unique in the Link series because it has roman numerals as its indexes, rather than Arabic numerals. Each numeral is prominently displayed in silver against a black dial, making the time easily readable. 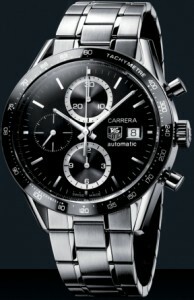 It also features 3 chronograph subdials at 6, 9, and 12 o’clock. The second counter, located at 9 o’clock, is oversized for easier viewing. The circles around these dials and the minute and hour hands are all made from polished Rhodium. The flange and main hands are luminescent for easy viewing when the lights go out. There is also a date window at the 3 o’clock position, and next to it is a monochrome TAG Heuer logo. Other features of the Link Calibre 16 Chronograph Roman Numerals include a fixed bezel that has a tachymeter scale and polished stainless steel push buttons. Its crystal is made from scratch-resistant sapphire and is treated with anti-reflective coating on both sides. It has a polished stainless steel crown and is water resistant to 200 meters.